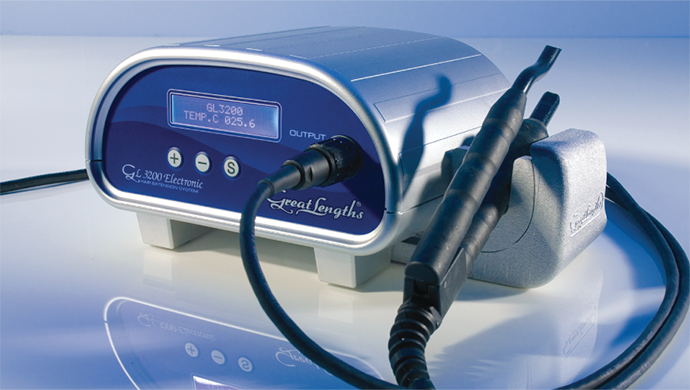 The original and still unrivaled Great Lengths Classic Thermal application machine. Producing results simply not possible with any other system, the Great Lengths Classic Thermal applicator tong is heated on one side. The temperature, which is approximately the same temperature as the lowest setting on a standard curling iron, is used to soften the Great Lengths bond so it can be molded to your natural hair. Unlike other systems, where glue guns and wax melting pots are used, the Classic Thermal applicator allows for a very clean and precise application. The result is undetectable attachments that are brushable, durable and non-damaging. The Next Level in hair extension application technology. 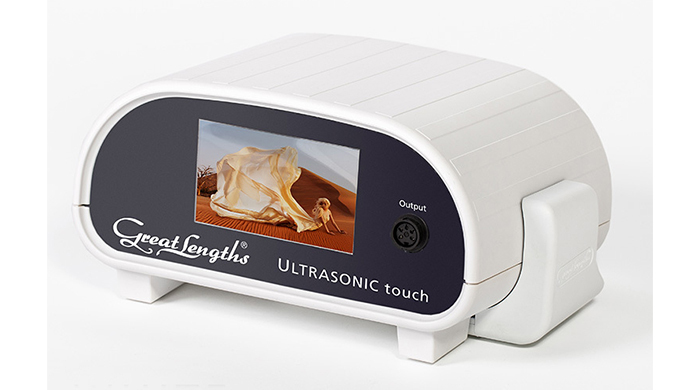 Whereas the original Great Lengths Classic Thermal method utilizes heat to soften the bond so the bond can be molded around the group of natural strands that the bond is attaching to, the Ultrasonic Touch method utilizes ultrasonic wave. This wave or “vibration” action generates heat within the bond and this allows the bond to surround each individual strand within the group of natural strands the bond is being attached to. 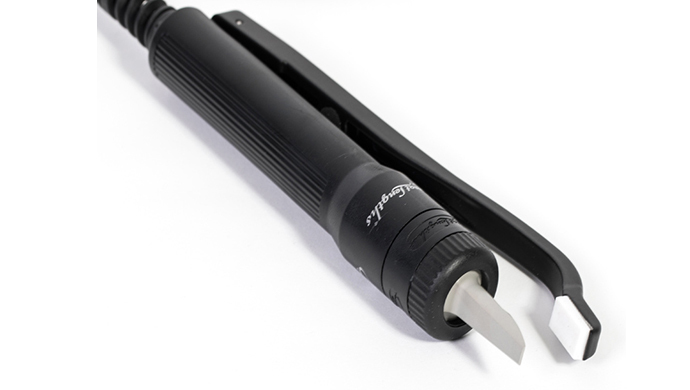 This added bonding security allows the stylist to mold the bond attachments into “flat” bond formation without compromising the bond “seal” to the client’s hair. Of course, traditional “round” bond formations with the Ultrasonic Touch are possible too. This gives the stylist more application options to truly customize their Great Lengths Services to each client’s specific need and desired result. Great Lengths Tapes can be used as a single tab or double tab tape-in extension. Using the same virgin quality hair Great Lengths is known for, GL Tapes are customizable with a smaller adhesive tab for a discreet application while providing more hair for voluminous, luxurious results. They are resuable and resilient for the client who demands the ultimate in a tape-in extension. What a tape-in extension should be. GL Apps by Great Lengths is a double-sided, single tab tape-in extension system. Using the same virgin quality hair Great Lengths is known for, GL Apps give stylists the opportunity to introduce extension services to a broader client base with lower application price points and less application time commitment, all without compromising the quality of the hair used or the resiliency of the application. 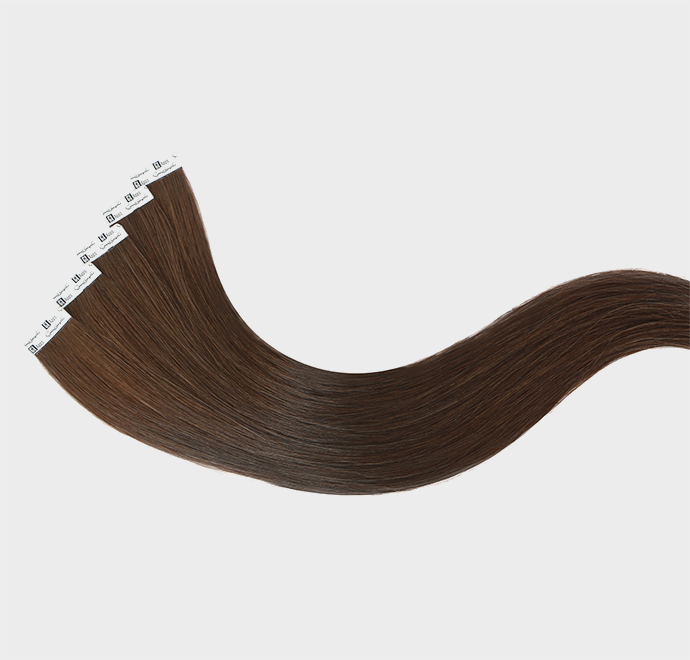 The attachment site is securely sandwiched between fine layers of the client’s natural hair, resulting in the most undetectable attachment of any tape system on the market. GL Apps are a high speed connection application system and as any good app will do, they make getting extensions easier, faster and more accessible.